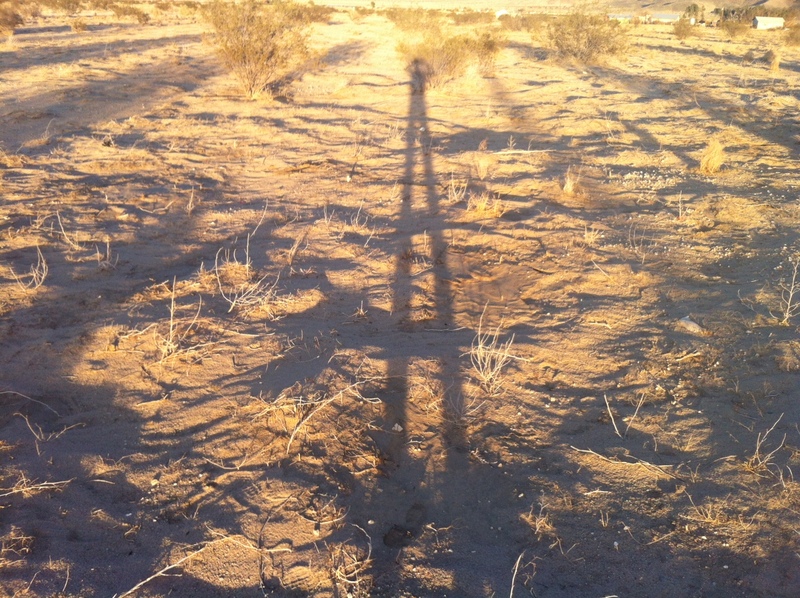 Last week I realized that I’ve been working near a latitude and longitude microconfluence in Twentynine Palms, so I walked over to it on my lunch break. 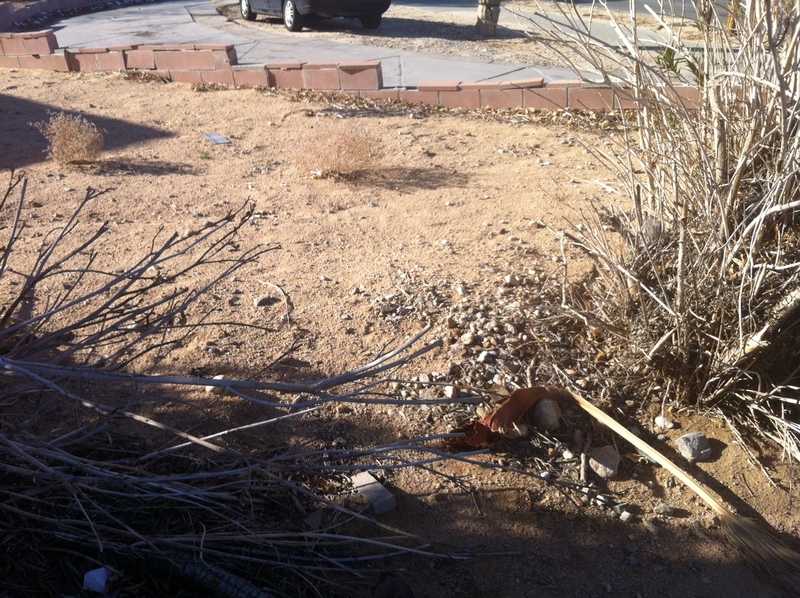 The spot is in the front yard of a house on the southwest corner of Two Mile Road and Aztec Avenue. You can see the yard through a gap in the “hedge” that I’m shooting through, with a concrete U driveway on the other side of that awesome cinderblock wall. The funny thing about this adventure was that it took finding three microconfluences on Two Mile Road (the first two are here and here) before realizing that Two Mile Road is right on 34.15 degrees north latitude (34 9′ 0″) all the way from Joshua Tree into Twentynine Palms, even though the road doesn’t go through. (Copper Mountain is in the way.) I didn’t expect such consistency from early Morongo Basin road builders. I see that I can find three more microconfluences just by following the line of Two Mile Road between Joshua Tree and Twentynine Palms, probably climbing part of Copper Mountain in the process. The purple dots are microconfluences. 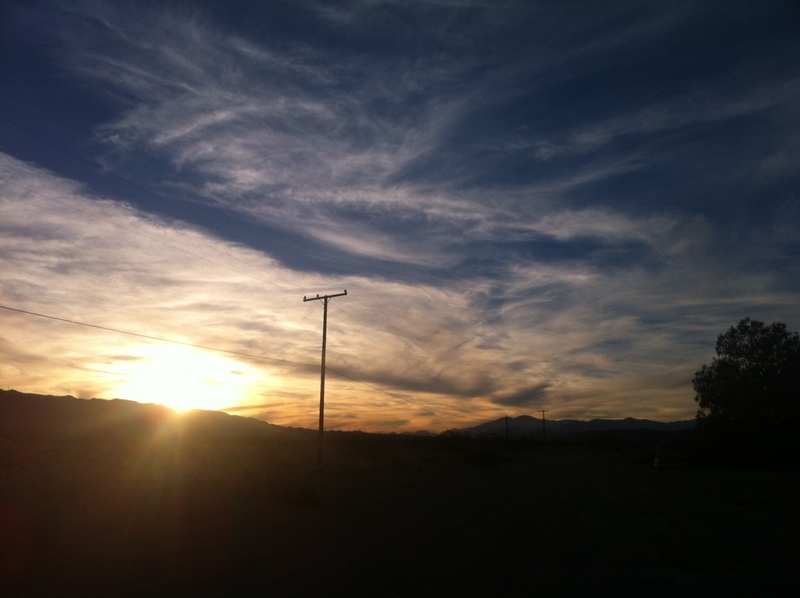 From left to right, Joshua Tree, Sunfair, Twentynine Palms. The same basic area on Google Maps. JT National Park is south of the highway, Copper Mountain to the north in the middle. Two Mile Road is not paved in JT, so it’s hard to see. I think you can click on this image to see it bigger. 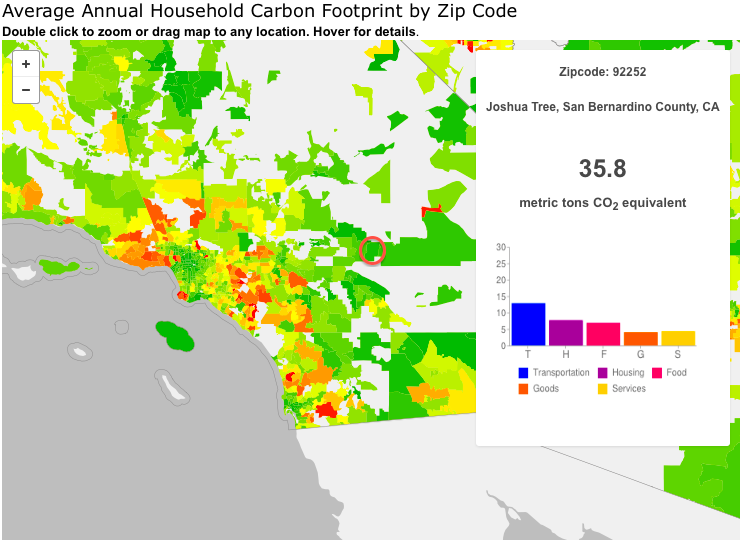 A total carbon footprint for both Reanna and me of 19.7 tons of CO2 in the last year is “59.9% better than the average household in the United States with 2 people and similar income.” It’s also 55% of the 35.8 tons of CO2 they estimate for average in Joshua Tree. I wonder why they match by income. What I’d really like to know is our number of standard deviations from the Joshua Tree, US, and worldwide average: where we are on those Bell curves. Beneath these results, Cool Climate Network lists 41 ways to decrease our carbon footprint, mostly things that the survey did not ask about. We’ve done about 20 of them already, though some we could do more of. 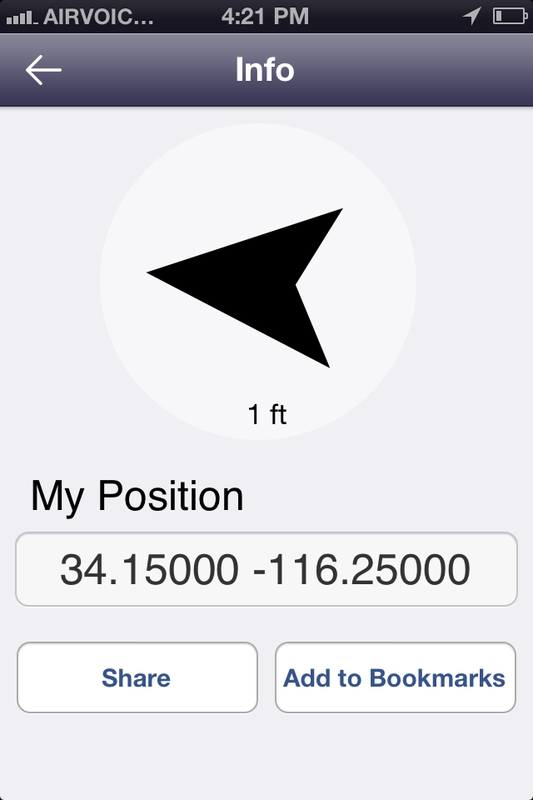 This is another way a more detailed calculator would be better. Those 20 things we’ve done already add up to about 6 tons of CO2, so it may be that our actual footprint is more like 14 tons of CO2. Reanna and I drive our Yaris about 1,200 miles a month. That’s less than 40% of average if what they mean is how many miles individuals are traveling in vehicles per month. 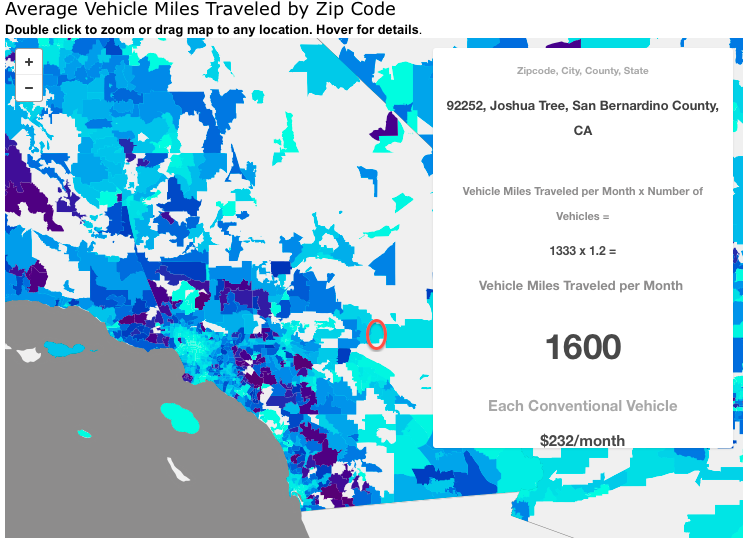 They could mean how many miles each vehicle travels per month, though, which places us at 75% of average. 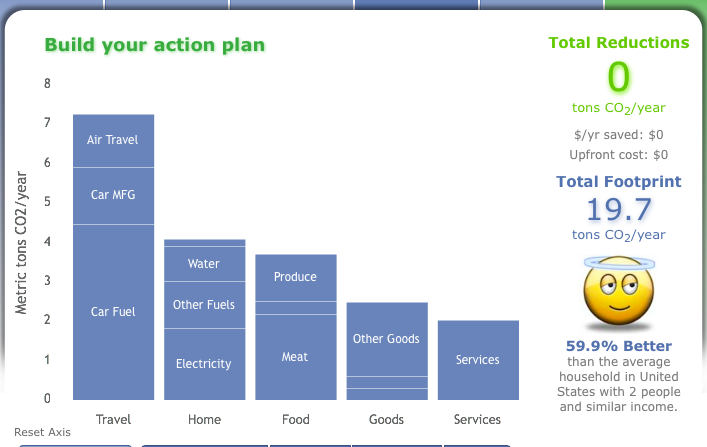 I tried out a three carbon footprint calculators (and wrote about it here and here) in 2012, which produced estimates of 10.41, 13.7, and 17 metric tons of CO2 for me. That makes it look like Reanna and I were somewhere between average and 2/3 of average, which I doubt. 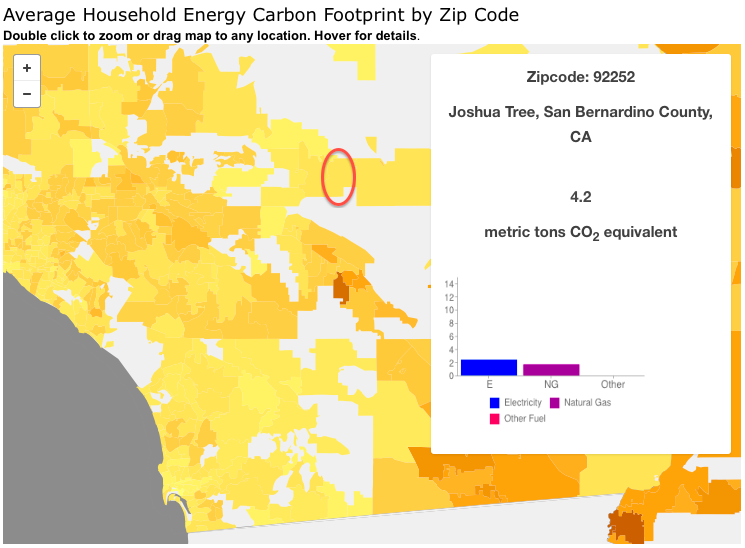 I bet we’re at half or less of Joshua Tree average–we live in a very small space with solar-generated electricity, don’t spend much money, and drive a fairly efficient vehicle–but I can’t prove it without a really good, thorough carbon footprint calculator. Can anyone recommend one? Where to Wear the Cell Phone? I don’t carry a cell phone in my pants pocket any more, unless it’s in airplane mode or turned off. Several months ago I read and agreed with Tim Ferriss in The Four Hour Body that you probably don’t want a radiation emitter cuddling with your testicles. He apparently tripled his motile sperm per ejaculate during an eleven-week program of no phone-testicle cuddling, cold treatments, and eating Brazil nuts. 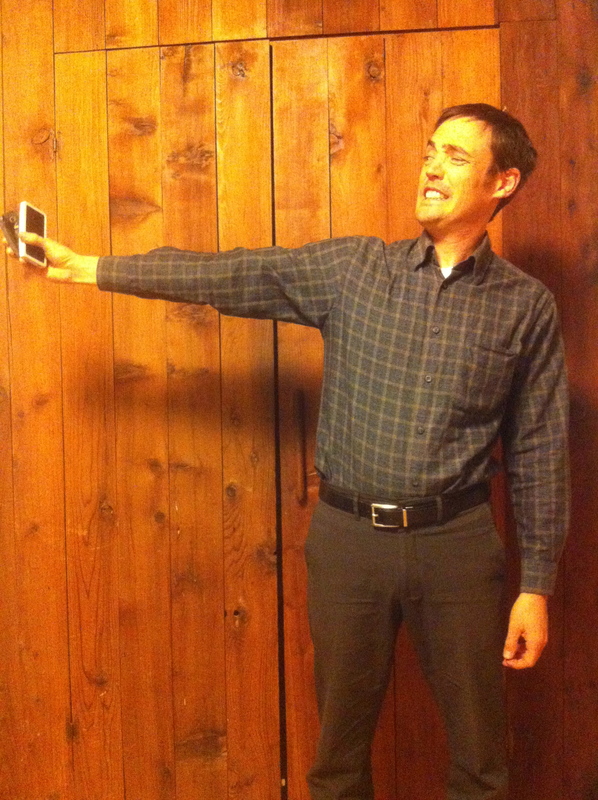 So I carry my cell phone in my breast pocket if I have one and in my hand if I don’t. The problem is, I also care about my heart, lungs, muscle, bone, and lymph nodes which my cell phone is now cuddling with. And I don’t care for the phone-strapped-to-arm look. I often just keep it turned off or in airplane mode, which is fine. I don’t mind not being on call to everyone who has my phone number. But now I am actually and professionally on call. My work has a two-week rotation for therapists to be on call 24 hours a day for crisis intervention and I’m on until next Monday. My work cell has to be on and it has to be on my person or I will likely miss a call. So now I’m carrying two phones. I took the dirt bike out to find my second microconfluence this afternoon. (See my post about the first here and about Charlie Loyd’s proposal of the idea here.) I’ve decided to go after what I’m thinking of as “minute-microconfluences,” which are microconfluences as defined by Charlie (decimal degrees at the hundredths) and also intersections of minute-lines of longitude and latitude. 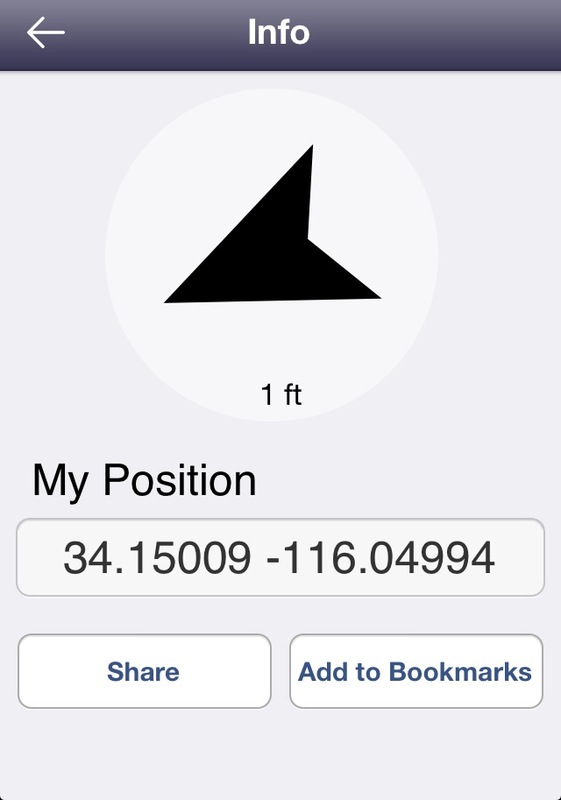 This is partly because they are farther apart and so feel slightly more… well, rare if not important, but mostly because the app I have that reads latitude and longitude in real time does so in the minute-second version. Perhaps this will offend metric purists, but I guess it would be nice to write something important enough to metric purists to cause offense. 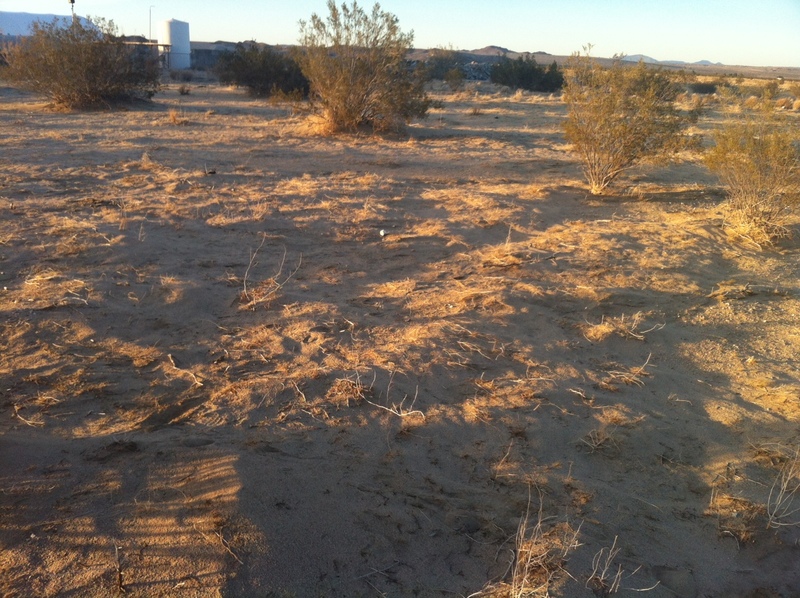 I found it just north of Two Mile Road and just east of the cement factory. To the north and east were Sunfair Airport and Sunfair Road, respectively. Looking just west of north over the spot. Concrete debris in the background is the north end of the cement factory. The sunset heading home was the best part.